Administrative law judges have ruled that San Francisco Unified and Sacramento City Unified exceeded their authority to protect teachers at high priority, low-performing schools from districtwide layoffs this year. Both districts have targeted extra resources for teacher training and strategies in hopes of stanching the turnover of teachers and reversing the dismal test scores at some of their most troubled schools. Both districts said they needed three years to build new models – “incubators of innovation,” as Sacramento City called them ­ – so that they could then pass on what works to other schools. 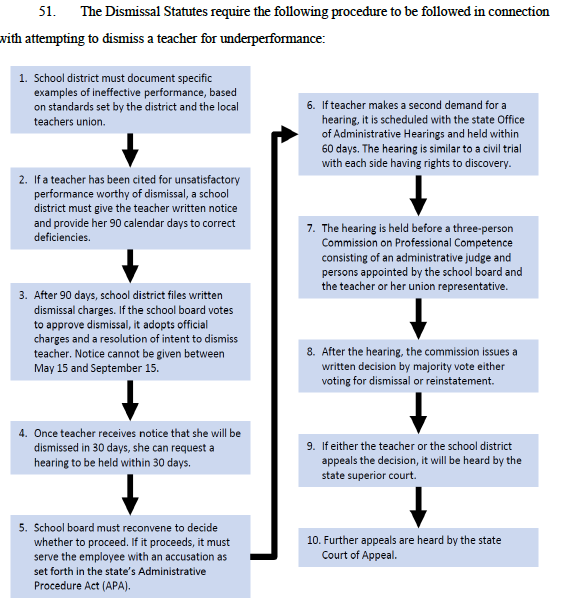 But state law permits few exceptions to layoffs based on seniority, and the administrative law judges ruled that San Francisco Unified had failed to make a persuasive case for bypassing seniority, and that Sacramento City had partially done so, for a majority of teachers ­and not for counselors at only five of seven schools that the district sought to protect. Administrative law judges’ rulings in layoff disputes are advisory to school boards, and Sac City Unified’s board has decided to ignore elements of the latest ruling dealing with the district’s Priority Schools. After a contentious five-hour meeting on Friday, board members voted unanimously to exempt all of the staffs at all seven schools. The board’s resolution said that Administrative Law Judge Ann Elizabeth Sarli had made factual mistakes in deciding who qualified for layoff protections. Last year, a different administrative law judge ruled that the district could exempt staffs at most of the Priority Schools. State law is emphatic that teacher layoffs should be by seniority. However, there are two exceptions, one narrow and one broad: The specific exception permits teachers with special training and experience to teach specific courses or courses of study when there are no senior teachers with the requisite training and experience. The other allows deviating from seniority in order in order to protect students’ fundamental constitutional right to equal educational opportunity. 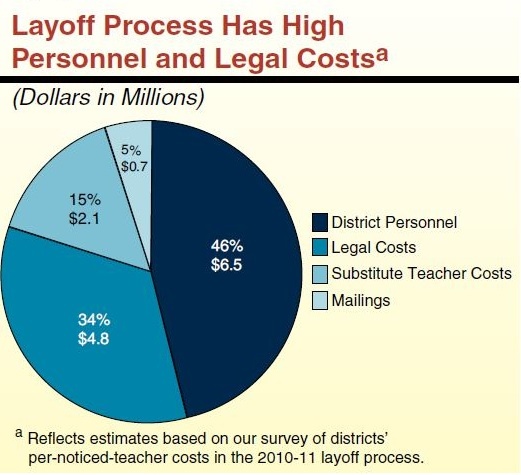 Los Angeles County Superior Court Judge William Highberger cited the latter exception last year when he issued a landmark decision that permitted Los Angeles Unified to protect 45 of the district’s lowest-performing schools, which had experienced a chronically high turnover of teachers, from layoffs. Such a churn of staff had violated students’ rights and hindered the district’s efforts to turn the schools around, Highberger ruled. LAUSD is about to enter the third year of shielding 45 schools, some of which have been replaced because they’ve shown improved scores and teacher stability. But Highberger’s decision has limited jurisdiction, and administrative law judges and other courts won’t have guidance on the equal protection issue until an appeals court rules on it, said Catherine Lhamon, an attorney with Public Counsel Law Center that brought the lawsuit on behalf of students in threeLAUSD schools with the highest turnover of teachers as a result of seniority-based layoffs. San Francisco Unified didn’t cite the equal protection argument in making its case to Judge Crowell, even though the 14 Zone schools have been facing sanctions as low-performing schools for more than six years and are receiving multimillion-dollar, three-year federal School Improvement Grants that stress the need for a well-trained, stable school staff. But Crowell ruled that the Zone schools don’t qualify as a course of study, in part because all San Francisco schools have the same core curriculums; the district failed to show that other schools in the district didn’t have the same level of teacher training as in Zone schools; and it didn’t establish that more veteran teachers couldn’t fill the jobs of teachers who’d otherwise be laid off. Sac City did make the equal protection argument in arguments before Sarli, but she dismissed it. She said that many schools in the district are facing similar sanctions for low performance and also have high rates of poverty; they’d be disadvantaged by disproportionate layoffs if the Priority Schools were protected, she wrote. The district argued that teachers and counselors in the Priority Schools have formed special bonds with the students and families; breaking those relationships would be detrimental to students. It also said that a stable teaching staff was important to assess the effectiveness of the new programs at Priority Schools. These intangibles and the ability to create what Raymond calls “a collective esprit de corps” may be why Priority Schools are showing positive results. But these and other reasons aren’t grounds under state law to bypass seniority procedures, Sarli said. It all comes down to whether the teachers in Priority Schools received specialized training that teachers in other schools didn’t get. On this point, Sarli and the district partially disagreed. Sarli said that counselors, first-year teachers at Priority Schools and all staff at a first-year Priority School (Rosa Parks Middle School) and at Hiram Johnson High School didn’t receive enough specialized training to qualify for an exception. The district testified that they did. Sarli and the district agreed that the remaining teachers at five Priority Schools, all elementaries, were entitled to an exception. I understand that at the hearing on Friday, parents and teachers at Priority Schools stressed how the restructured schools were having a huge impact on students’ lives. Teachers from non-Priority Schools stressed that they too are working hard, collaborating, getting extra training, to meet the needs of these same diverse children. What’s clear is that whether at a Priority School or not, layoffs are destabilizing all schools and demoralizing teachers. Until they stop, some districts will turn to triage on behalf of the most besieged students. Good teaching matters. Yet most teacher evaluations are compliance-driven checklists that have little or no impact on teaching and learning. The question is not whether teacher evaluation should be improved, but what the goals of the new processes we seek should be. The received wisdom is that better evaluations would provide teachers with useful feedback and also improve decision making about tenure and retention. Critics also note that in a better system, evaluations would be more frequent, more focused on evidence of student learning, more effective at sorting teachers into multiple performance categories, and more valid, in that evaluators would be highly trained. All of these are worthy goals, but hardly inevitable ones. Not only are they expensive, but they fail to address the realities of the current approach to teacher evaluation. Here are some inconvenient truths that reformers of teacher evaluation must address. Districts treat teacher evaluation as first and foremost a tool to remove a truly weak teacher. The resulting process is highly scripted because it is used to build a legal case in the event it is needed. 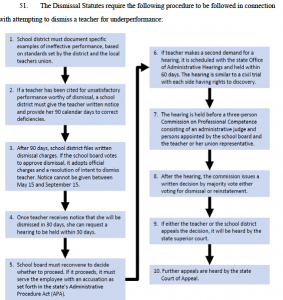 While districts believe in the value of feedback and coaching for teachers, it is not clear that formal evaluation – with all of its legal constraints – is the best tool for this purpose. 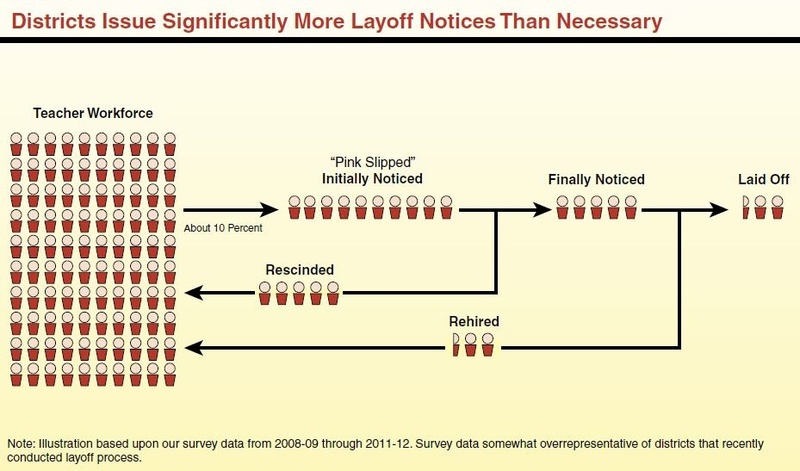 Districts rarely remove teachers, in large part because of the high price tag. Better evaluation doesn’t change this, and those who believe that better evaluation processes will lead to more weak teachers being dismissed aren’t being realistic. California has close to the highest ratio of teachers to administrators in the nation, which means that school principals are ridiculously overloaded. A better evaluation process won’t end the checklist approach if principals are the people doing the evaluating. Staff development budgets for teachers have been slashed, and it may not make sense to invest heavily in training teacher evaluators when we cannot afford to train the teachers. In the past, many large urban districts rarely opted not to tenure a teacher, and this led to granting tenure to some weak teachers. In the vast majority of cases, this was a reaction to a chronic teacher shortage. If you can’t staff your classrooms, you will tenure the folks you’ve got. 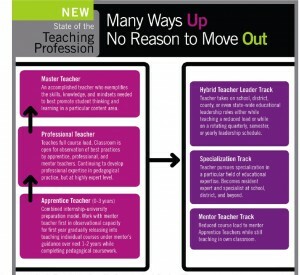 The current hiring climate will change this situation without a better teacher evaluation process. I believe that better teacher evaluation is worth working on, but we need to rethink the goals. Acknowledging that if useful feedback to teachers is the goal, then the most useful feedback will always come from other teachers, not from an administrator. This means that the vision of excellence and rubrics associated with it must be used broadly in the district by teachers as well as administrators. It is too soon to determine what will come of the collaborative and inclusive approach suggested above, or for that matter from the more scripted approach being taken in districts receiving federal school improvement grants (SIGs). What is notable is how different the conversation sounds – more cautious perhaps, but also nuanced – when the North Bay Collaborative meets than when teacher evaluation is discussed by policymakers or in the media. This disconnect is hardly new, but in this case what it signals matters. A group of billionaires, old-line political movers and shakers, and influential advocates released their recommendations Monday for changing the state’s tax structure to increase state revenues by $10 billion a year, with half of that going to K-12 schools and community colleges and another $2.5 billion for the University of California and California State University. The Think Long Committee for California, chaired by Nicolas Berggruen, founder and president of Berggruen Holdings, intends to place two initiatives on the 2012 ballot to overhaul the state’s tax and finance structures, and to amend the school funding law, Proposition 98. The proposals, explained in the committee’s 24-page report, A Blueprint to Renew California, seek to get the state out of debt by reducing personal income taxes at every level, cutting corporate taxes, and reducing sales taxes for consumer goods while extending them at a higher rate for services like haircuts, accounting, and car repairs. Similar ideas have been kicking around for years. In early 2009, Gov. Schwarzenegger established the Commission on the 21st Century Economy, which also proposed tax code changes to stabilize the state’s revenue. That commission, which was chaired by Gerald Parsky, now a member of the Think Long Committee, failed to get any traction in the state legislature. After that, the $5 billion becomes an additional permanent source of discretionary funds for schools that is not subject to the fluctuations of state revenues, according to Tim Gage, a consultant to the committee. 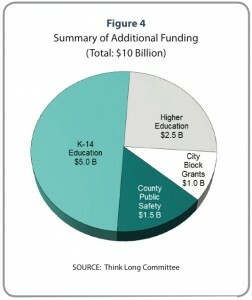 However, it doesn’t get folded into Proposition 98, which would raise the base amount due to schools. 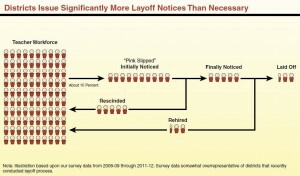 But there is a caveat. In exchange for the annual $5 billion, the state would never have to repay as much as $14 billion in maintenance fees; that’s the gap in funding that occurs during recessions or other economic downturns, when Prop 98 is either suspended or reduced. Schools are currently first in line to get that money restored when the economy improves. “Somebody borrows money from you; they borrow $100 and they come and say, ‘I know I owe you $100, here’s $4, but first you have to change your hairstyle, lose a little weight, and tune up your car.’ Excuse me, you have a legal debt, a constitutional debt created by two constitutional amendments,” said Mockler. 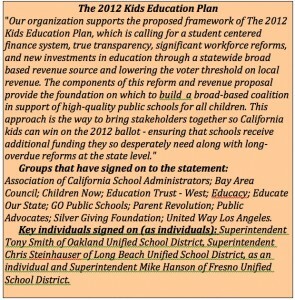 The California Teachers Association slammed much of the Blueprint, calling the Think Long Committee “out of touch with California voters and their commitment to fund public education,” based on some recent polls. “Rather than help public schools recover from the billions they have lost, the committee ties future funding increases to unproven education reforms. This is taking the state in the wrong direction,” said CTA president Dean Vogel. Since members of the Think Long Committee were not appointed by any government agency and have no ties to special interest groups, they weren’t beholden to any point of view and reached consensus on all the proposed recommendations, wrote Berggruen in the Sacramento Bee article. *Complete list of members: Nicolas Berggruen, David Bonderman, Eli Broad, Willie Brown, Gray Davis, Maria Elena Durazo, Matthew Fong (the former State Treasurer died June 1, 2011), Ronald George, Antonia Hernandez, Robert Hertzberg, Gerry Parsky, Condoleeza Rice, Eric Schmidt, Terry Semel, George Shultz, and Laura D’Andrea Tyson.